The sun is finally shining here in the UK and I am more than happy about it. It’s been long overdue after what felt like the longest Winter ever, and now that the weather has finally warmed up I’m fully making the most of it. My weekends have been spent going on day trips and spending as much time outdoors as possible. This weather has quickly got me into summer mode and now I’m counting down the days until my beach holiday with the girls but not only that, I’ve finally started planning what to take with me too. 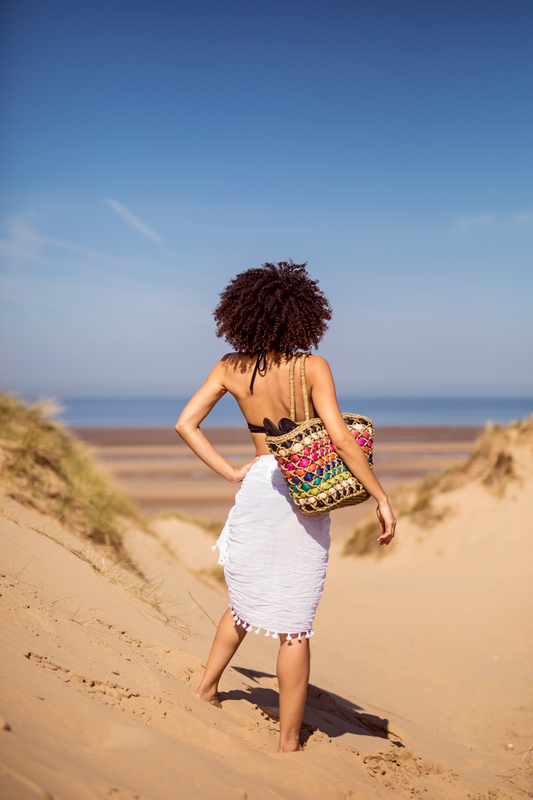 It’s no secret that I have ‘a thing’ for bags, so whether I’m getting ready for a day in the city or I’m heading to the beach during my Summer holiday, I usually already know what bag I’ll be using before I pick out my outfit. 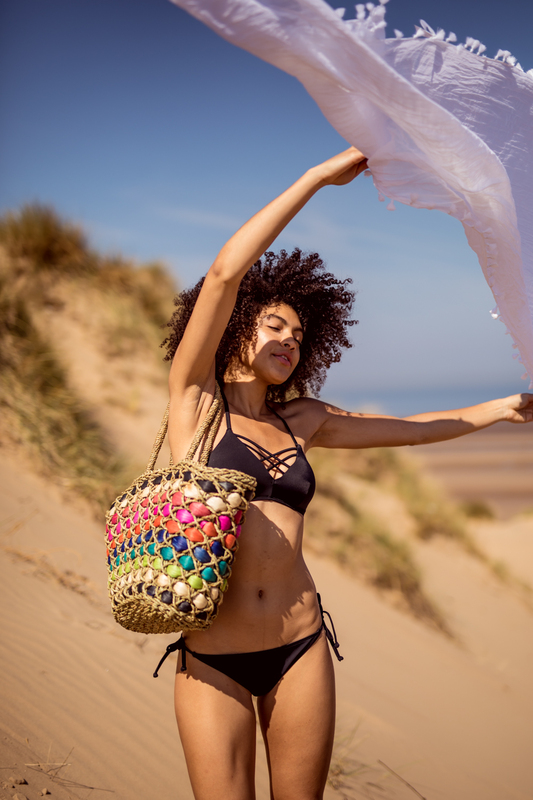 It’s been a good long while since I went on a proper beach holiday so I was ready for a new beach bag, and I instantly fell in love with this rainbow straw bag I found whilst browsing House of Fraser’s holiday shop. Straw bags are everywhere at the moment and whilst I’m not usually one to jump on a trend, I have to say this is one trend I’m happy to get on board with. 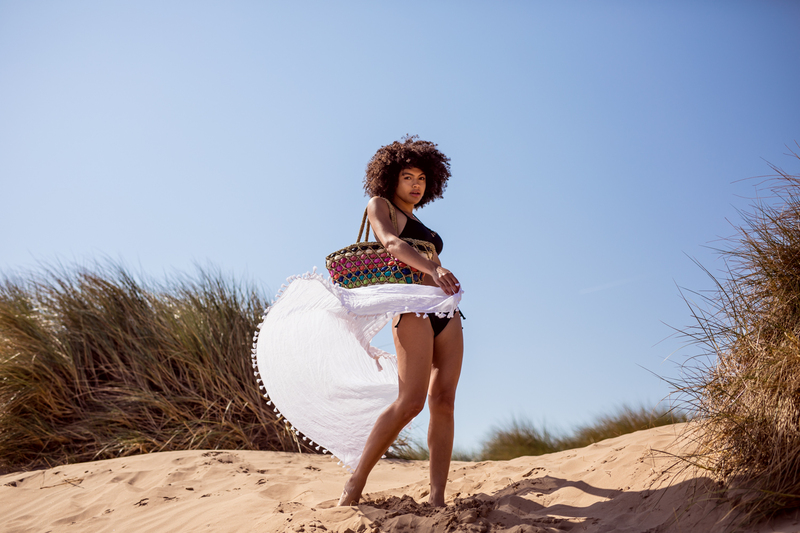 It doesn’t really get much more summery than a straw bag, not to mention a rainbow one! 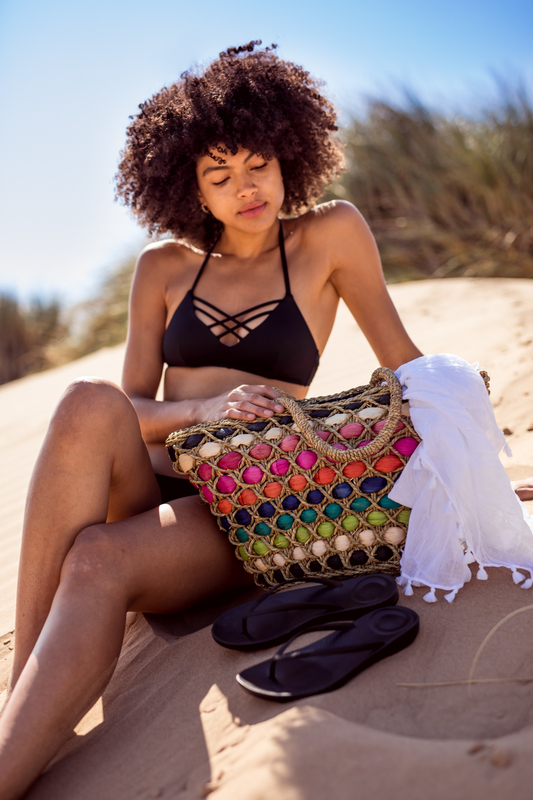 I’m more than pleased with this jazzy little beach bag and it’s the perfect size to fit in all the essentials for a day at the beach. Of course swimwear is always a main priority when heading to the beach and this Summer I’m hoping to go for a selection of plain two pieces that are easy to mix and match. I don’t think I’ve ever gone for a black bikini before now. 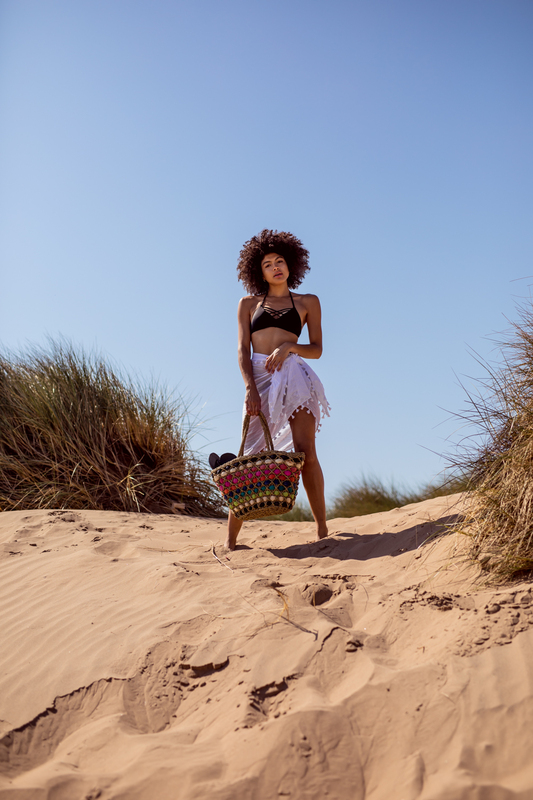 The idea of wearing black to the beach admittedly sounds somewhat boring, but when you’re able to jazz it up with colourful accessories, it still maintains that Summery vibe and I feel this Dorina two piece actually works great with the rainbow bag. 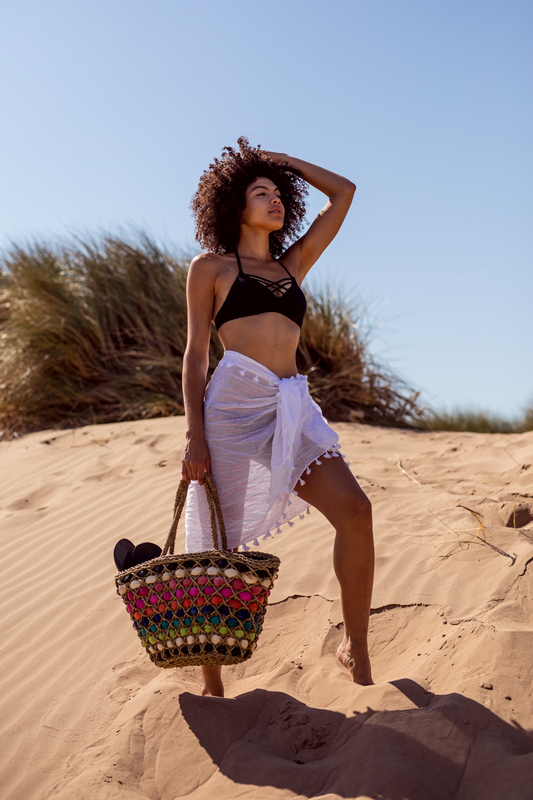 The mesh bikini top is really flattering too and I’ll even be able to mix and match it with other coloured sets if I want to add an extra pop of colour. When it comes to beach accessories, I also like to keep these pretty simple (especially as the bag is the star of the show here). The must have beach accessory for me are flip flops, or any sort of easy slip on shoe that can get you from your place, to the beach and from the beach to the beach bar (priorities). I’ve gone for a black pair of Fit Flops, because comfort is priority and these babies have a cushioned sole…and with them being black they will of course go with just about any beach attire when I do decide to mix things up. 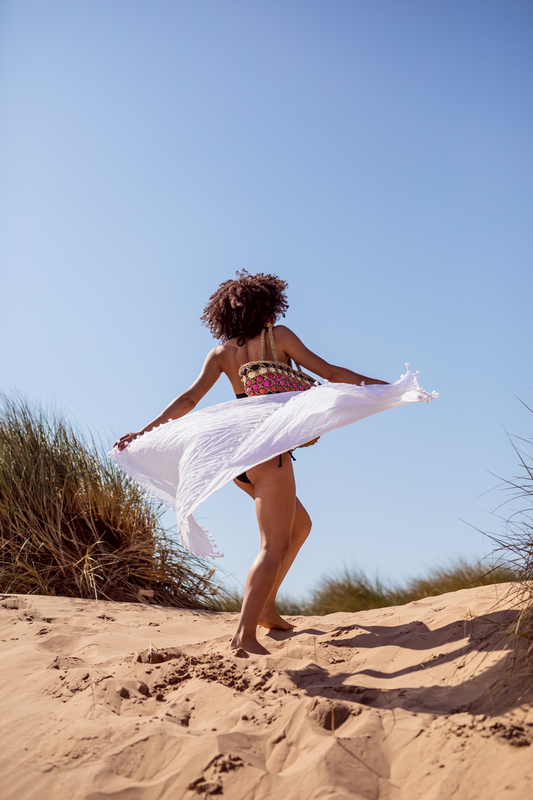 Footwear aside, I feel that no beach get up is fully complete without a sarong…Having said this, I actually don’t think I’ve had a sarong for a long while either. Somehow they are always the beach accessory that I forget to buy and then when I’m on holiday and heading to the beach, I end up pulling together a random outfit combination of some denim shorts, and the T-shirt I wore over on the plane (this actually happens every time). Well this time I’m full beach attire ready with this cool little Seafolly wrap to finish off the look, (which also makes an excellent prop for wafting around in pictures). I think this makes a great little coverup, which again, will go with anything and completes this beach look off just perfectly. So there you have it, a full low down on my beach attire and the new pieces I’ll be taking on holiday with me this summer. Now I really can’t wait for my holiday but in the meantime I’m more than happy with way things are going here because this weather is making me so, so happy! The fact that even here we’ve been having proper beach appropriate weather is enough to put a big smile on my face and it’s also a great excuse to try out the new beach attire early. When Damien and I headed to the beach last weekend it was a scorcher, so may it continue! Are you off on any beach holiday’s this summer, or do you have any day trips planned to visit a beach near you? These photos are beyond stunning, Samio! Looving the beachy vibes and that bag is the prettiest!